(down front on a knee, left to right) Allen Beloin, Member; ‘Tony’ Anthony Becker, Member. Like many of our current Board members, John was recruited by an active former Board member. He was born and grew up in Trinidad, then studied at Colorado State University (CSU) and earned a BS in Construction Management before moving to Greeley in 1973 with his wife, Nancy. John and Nancy have been married 48 years, they have two adult sons, John, Jr. and Chris, and six grandchildren. John worked for Hensel Phelps and Flatiron companies. He owned and operated J-2 Contracting for over 30 years before turning it over to his son Chris. John purchased and operated the Indian Cave Ranch from 2003 – 2012, sold it and then purchased the Leone Ranch east of Eaton, which he continues to operate. John believes in volunteer service. He has actively participated with the American Cancer Society and the North Colorado Medical Center (NCMC) smoking cessation program; Greeley/Evans School District 6 Accountability Committee. He was the Greeley Stampede Chairman in 1983 and spent many years coaching his kids youth baseball, soccer and basketball teams. Randy is married to Sharon and they have one daughter, Alexis who will leave them with an empty nest this Fall when she heads off to start her college experience. 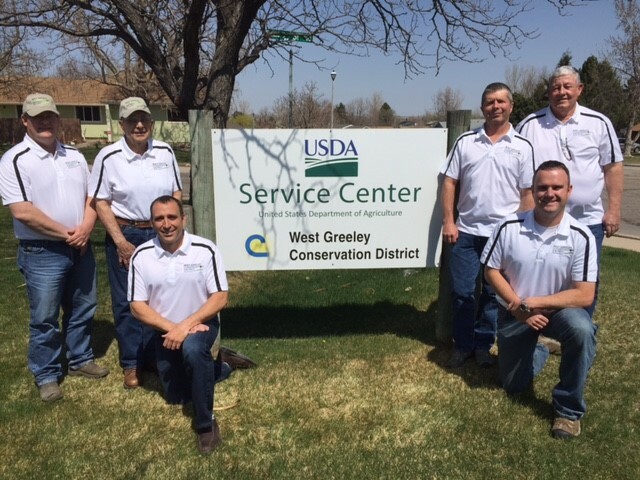 Randy said he was introduced to the West Greeley Conservation District by Stan Cass. He became passionate about the District’s mission to conserve the land and water – because he believes it is important to the future of Weld County. Protecting our natural resources has always been something Randy believes more people should be concerned about. Lenny has been a devoted Board member for the past 12 years, currently working closely with the staff in the position of Secretary-Treasurer. He grew up in the Ault area and graduated from Highland High School. He also pursued and graduated with a B.S. in Animal Science from CSU. Lenny and his family have been hog producers and irrigated farmers since he graduated from college. Lenny is a 4-H leader, a service he has been passionate about for more than 30 years – helping area youth with their projects. The club pigs he has sold have proven to be winners for many kids! The Simpsons have a history of champion and reserved champion hogs that youth have shown all over the state. In 2011, a Simpson hog won Grand Champion at the Weld County Fair. That same year, another of their hogs was named Reserve Grand Champ at the National Western Stock Show. They have also raised Hampshire show lambs. Lenny is married to Lisa, who works at State Farm Insurance. They have a daughter, Nikki True, who is married and has blessed them with two grandchildren. Their son Logan has traveled to China where he is pursuing his Masters degree. Tony is a 5th generation Coloradoan who grew up in Northern Colorado. He is married to a gifted nurse, Michelle, who works for Poudre Valley Hospital. The two have a rowdy 5-year-old son, Levi, a beautiful 3-year-old, Molly, and 2-year-old, Sam, completes their family. They love being outdoors as a family playing and working their small acreage. Tony took advantage of the WGCD’s annual tree sale in 2012, that opened the door. The more he learned about the District’s services and resources, the more he was motivated to share how the District can assist small land owners with some of the challenges they face. Tony is working towards his Masters in Agricultural Sciences from CSU. He has served the USDA Forest Service/Pawnee National Grassland as the agency liaison to chambers of commerce and tourism groups, which lead him to serve on the Greeley Chamber Board of Directors and the Greeley Convention and Visitors Bureau. He has also participated on many military boards. Tony is a Captain in the Colorado Air National Guard serving in Greeley where he is a flight commander, He has served in the Guard since he was 17 and has deployed four times. He is a “make it happen” person with experience in policy development, public outreach, adult and youth education. Allen was born and raised in Colebrook, New Hampshire, which is a small town about 5 miles from the Canadian border. He worked on the family’s small Dairy and 600 acre farm tending their Christmas tree plantation and logging. After graduation from Colebrook Academy he enlisted in the Air Force and was trained in satellite communications. In 1997 he separated from active duty and enlisted in the Greeley Air National Guard continuing his career in satellite communications. In 2001 he started AB Dirt Works, a small excavation company serving commercial and residential projects. In 2003 Allen says, “I married my partner and best friend, Lorena.” In 2009 they started their family and now have three wonderful boys: Alexander, Christopher and Spencer. Allen joined the WGCD after realizing how delicate our ecosystem is in Colorado compared to where he grew up in Northern New Hampshire. “I grew up thinking a sprinkler was nothing more than a device you set up on your front lawn to take the edge off a hot day. However, in Colorado, water is a resource that must be balanced between farming, commercial, residential, and recreational demands. With this balance, we need to communicate, educate and train people on ways to get the most out of our resources while still enjoying the great benefits of living in the high plains of beautiful Colorado. Richard is a retired farmer and dairyman. He and his wife Wilma farmed for 51 years east of Lucerne, growing corn, hay and sugar beets. They raised three children, a son, Rich, and two daughters who helped on the farm while attending school in Eaton. They sadly lost their son, in 1985. Their two daughters still live in Weld County; Kristal is a teacher in Eaton and Janell owns a business in Greeley with her husband. Their family also had to say farewell to Wilma in 2011 when she passed away. Richard not only brings solid farming experience to the WGCD Board, but also a greatly respected historical perspective having served on the Board for 24-years – plus one additional year as Member Emeritus. During his tenure, Richard was the WGCD Board President for 12 years and was in that position when the District was honored by the Good Year Tire Company with their prestigious award naming WGCD the Conservation District of Colorado (we are one of 76 Districts in our state). Richard attended that meeting in Phoenix, at Good Year’s expense, to accept this award for the District. Richard also devoted 10 years as a Board Member with the Colorado State Conservation Board (CSCB) and served as their secretary. He reports that he traveled and represented the CSCB at two Regional Meetings; one in Anchorage, Alaska and the second in New Orleans, Louisiana. Richard is a character, so I know he could tell some great stories about his experiences and those trips. Richard says he considers retiring, but he needs to serve out his term with the Colorado Association of Conservation Districts Water Committee.